All season long, PFF has ranked the best performing NFL rookies as they raced for Rookie of the Year. With the regular season now finished, PFF presents the top-10 rookie performances of the 2017 season, including the Rookie of the Year! PFF Elite Stat: White allowed a catch just once per every 15.8 snaps he spent in coverage this season, the 10th-best rate among corners. White stepped in right from Day 1 and showed that he didn’t just belong in this league, but he was ready to dominate it. White has held a top-three spot on this list for all 17 updates, and after claiming the top spot after Week 14, he never looked back. The former LSU star finishes the year ranked third among all cornerbacks with his elite overall grade, and he was as reliable a corner as there was all season. He led all corners with 1,093 defensive snaps played, and he finished 13 games with a grade of at least 70.0. Opposing quarterbacks had just a 68.2 passer rating when targeting White in coverage, and he was directly responsible for an incompletion (whether it be via pass breakup, interception or proximity in coverage) on 23.4 percent of the targets into his coverage, well over the league average of 15.0 percent. 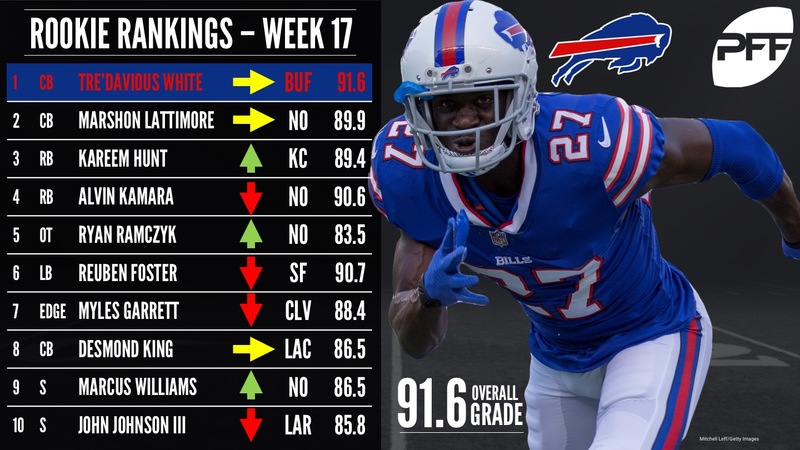 The Bills are in the playoffs for the first time this century and the play of PFF’s rookie of the year is a big reason why. PFF Elite Stat: Opposing quarterbacks had just a 45.3 passer rating when targeting Lattimore’s coverage this year, the third-best mark among corners. Lattimore finishes the year ranked seventh among cornerbacks in terms of overall grade after he posted game grades of at least 70.0 in 8-of-13 games this season – passing the 80.0 mark in seven of them. The first corner selected on draft day was one of just 12 cornerbacks this season to not surrender a touchdown, and among that group, the 451 snaps he spent in coverage were the second-most. Lattimore allowed a first down or touchdown on just 27.9 percent of the targets into his coverage this season, the 19th-best rate among corners. Like White, he also excelled at disrupting passes, with his 22.1 forced incompletion percentage ranking 15th and also like White, is a key reason as to why the Saints are hosting a playoff game this season. PFF Elite Stat: Hunt had 19 runs of at least 15 yards this season, the most among all running backs. In a race that was close right up until the very end, Hunt just barely edges out Alvin Kamara for PFF’s Offensive Rookie of the Year honor. Hunt ranks third among running backs in terms of overall grade at the season’s end, second in rushing grade and 13th in receiving grade. Hunt ranked fifth among running backs with a 7.0 explosive run rate (a run of at least 15 yards), and that number gets amplified by the fact that he had the sixth-highest carry total in the league – he had the ball in his hands more than most, and more than most, he took that ball and made a big play with it. Hunt was also wildly successful when it came to forcing missed tackles this season. He finished the season with a league-leading 77 forced missed tackles; only two other running backs (Melvin Gordon and Le’Veon Bell) broke more than 60. After the first month of the season, it looked like Hunt was going to run away with this award before Kamara stepped in and made this one of the tightest races of the year. When the smoke cleared and the dust settled, Hunt is your 2017 PFF Offensive Rookie of the Year. PFF Elite Stat: Kamara led all running backs with a 108.5 elusive rating in 2017. Kamara just gets edged out by Hunt for PFFs Offensive Rookie of the Year honors but that’s by no means a slight to him. The battle between him and Hunt was as close as Monday night’s Rose Bowl, and there are plenty of things you can point to if you wanted to make the case for Kamara. The rookie out of Tennessee ranks second among running backs in terms of overall grade, ninth in rushing grade and second in receiving grade – he was a true force with the ball in his hands this season, no matter how it got there. Kamara picked up a first down or touchdown on 34.2 percent of his carries this season – a rate that led all running backs – and he ranked second among backs with a stuff rate (a stuff is a run that goes for zero or fewer yards) of just 14.2 percent. The rookie completely revolutionized New Orleans’ offense once Adrian Peterson had departed, and he teamed up with Mark Ingram to give New Orleans arguably the most productive backfield in all of football this season. PFF Elite Stat: Ramczyk ranks 11th among tackles with a 96.6 pass-blocking efficiency rating. The only offensive lineman to even sniff this list all season, Ramczyk didn’t miss a single snap all year, and he ranked as the eighth-best tackle in 2017 in terms of overall grade. The rookie out of Wisconsin was a huge reason why Drew Brees faced pressure on just 22.6 percent of his dropbacks this year, the lowest rate among quarterbacks. Ramczyk was one of just seven tackles this season to post grades of at least 80.0 as both a run-blocker and pass-protector, and he finished 13 games this season with a grade of at least 70.0. PFF Elite Stat: Foster ranks sixth among linebackers with an 11.4 run-stop percentage. Playing time is the only thing that keeps Foster down on this list because, as our grade shows, when he’s been on the field, his play hasn’t just been good – it’s been elite. Foster finished the season ranked fourth among linebackers in terms of overall grade, and he’s 1-of-5 linebackers who finished the year with at least an 89.9 grade in run defense to go with a grade of at least 80.0 in coverage, putting him in a group with Lavonte David, Luke Kuechly, Sean Lee, and Bobby Wagner. On a per-play basis, no linebacker in football made more positive plays in run defense than Foster, who earned a positive grade on a league-leading 19.7 percent of his plays against the run, nearly doubling the league average of 10.1 percent. On top of that, he was one of the better linebackers at preventing targets into his coverage from gaining first downs or touchdowns, allowing either on just 25 percent of the targets into his coverage, the 11th-best rate among linebackers. With Foster leading the defense and Jimmy Garoppolo commanding the offense down the stretch, 49ers fans have already had a glimpse of what this team could do in 2018. PFF Elite Stat: Since Week 5 – when Garrett made his debut – his 18 quarterback knockdowns (sacks plus hits) led all rookies. Garrett finishes the season ranked 13th among edge defenders in terms of overall grade, and he’s 1-of-9 edge defenders to finish with grades of at least 85.0 in both run defense and as a pass-rusher. The first-overall pick finished seven straight games with a grade of at least 78.3 to end the season and graded below 74.3 just once all year. Garrett finished every game he played this year with multiple pressures, tallying at least three pressures nine times, and he recorded at least one knockdown in all but one contest. There were few bright spots this season for the Browns, but Garrett was certainly one of them. PFF Elite Stat: King ranks third among rookies with a 5.9 run-stop percentage. King ends the season ranked 13th among all cornerbacks in terms of overall grade, and he’s the only cornerback in the entire league to rank in the top-15 in both coverage and run-defense grade. The Chargers found him a home in the slot this season, and he sure did produce: His 380 snaps in slot coverage were the most by any corner not to surrender a touchdown out of the slot, he led all cornerbacks with 36 stops (with T.J. Carrie ranking second with 31) and his seven total pressures were the third-most by a corner this season. Many thought King would have to transition to safety in order to see the field in the NFL, but it looks like one year later, he has dispelled that notion. PFF Elite Stat: Williams surrendered just 0.13 yards per snap in coverage this season, the third-best rate by a safety. Williams has been a virtual mainstay on the honorable mention section of this race all throughout the season, finally cracking the top-10 in the season’s final update and giving the Saints a 40 percent ownership stake in this list. Williams ends his rookie year ranked 13th among safeties in terms of overall grade, and he is just 1-of-15 safeties to have earned marks of at least 80.0 in both coverage and run defense. Against the run, Williams excelled as a safety net on the back end of New Orleans’ defense, earning a negative grade this year on just 0.6 percent of his run-defense snaps, a rate that leads safeties and is over five times better than the league average. In coverage, he ranks 14th among safeties with a 23.1 forced incompletion percentage. PFF Elite Stat: Johnson ranked ninth among safeties this year with a 6.1 run-stop percentage. While the offensive renaissance that occurred in Los Angeles this season has garnered much of the attention, the play of Johnson on the back end of the defense has flown a bit under the radar. The Rams’ third-round pick ranked 17th among safeties this season in overall grade thanks to consistently strong play ever since he started seeing regular playing time back in Week 4. Since that uptick in snaps, Johnson finished 10-of-13 games with an overall grade of at least 70.0, including five games over 80.0. Not only did Johnson excel at stopping the run as a rookie, but he was right up there towards the top when it came to disrupting passes in coverage. His 24.3 percent forced incompletion percentage ranks sixth out of the 50 safeties who spent at least 400 snaps in coverage in 2017.